A fifth-wheel in a campground is office and home for Kyle Ries. Earning a living is the biggest roadblock that stops non-retired RVers from living their road trip dreams. Thankfully, many companies are exploring the benefits of hiring qualified employees no matter where (or how) they choose to live, as long as they have reliable Internet connectivity. One business that works almost exclusively with a distributed group of employees is TeamSnap, a Boulder, Colorado, tech company that creates web and phone apps to manage sports teams. The TeamSnap app allows parents, coaches, team managers and group organizers to communicate about their team through email, text and instant alerts. What makes this business so unusual is that nearly 10 percent of its employees aren’t just remote workers—they are full-time RVers too. It’s exciting to encounter a company that’s totally fine employing a vagabonding team of techs. 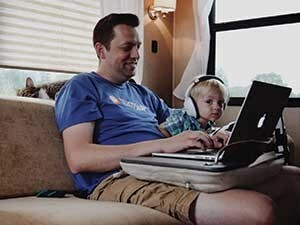 From Michelle Muranaka, a junior software developer who lives and works from a Mercedes Sprinter cargo van, to Geoff Lanotte, a senior software developer who full-times with his wife and kids, TeamSnap’s full-time RVers are helping to build a successful company while roaming the country. 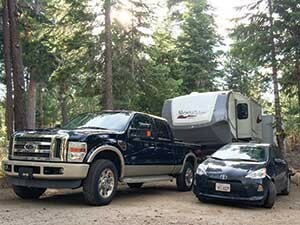 I asked four of the six full-time RVers at TeamSnap about their experiences as remote employees and here’s what they shared with me via email about living and working on the road. Who or what inspired you to hit the road? Is working on the road different from working in a stick home? Full-time RVing gives Geoff Lanotte more time with his family. Full-timing presents many opportunities for fun distractions that can take you away from your workday. But TeamSnap full-timers understand that steady discipline pays off and enables them to reap the dual rewards of earning a steady paycheck while living the lifestyle. 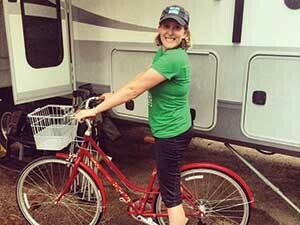 Full-time RVing lets Carly Ries, and husband, Kyle Ries, combine work and fun. Are you encountering any Internet connectivity issues? How does TeamSnap feel about remote employees? TeamSnap’s crew of full-time RVing techies is atypical, but the distributed workforce model is becoming more common. Many of today’s most successful businesses are hiring remote workers with all sorts of backgrounds. If you are one of them and you want to hit the road, you need not postpone your full-timing dreams. Your life on the road is one job offer away! Rene Agredano is a self-employed freelance writer, jewelry designer and animal advocate. Since 2007 she’s traveled with her husband and three-legged dog while chronicling their full-timing life on the road at LiveWorkDream.com. She also writes “The Full Timing Nomad” blog at rvlife.com. You addressed the issue of connectivity, but what do these folks (especially the ones with kids) do for health insurance??? My partner and I are almost ready to go FT, but we struggle with what to do about insurance.